Review by Karen Topham, American Theatre Critics Association member. Photos by Michael Brosilow. If Hillary Clinton’s three million vote plurality had been enough to propel her into the White House, we might be having a national conversation about women and maternity leave by now instead of institutional racism and scandals. Goodness knows it is a conversation we need to have, as the US remains the only developed nation in the world without paid parental leave and is woefully inadequate when it comes to support for new mothers in general, especially for a country in which so many people claim they are “pro-life.” In Molly Smith Metzler’s Cry It Out, now playing at Northlight Theatre, new motherhood and the various problems it presents are explored in a comic drama that every parent should be able to appreciate. 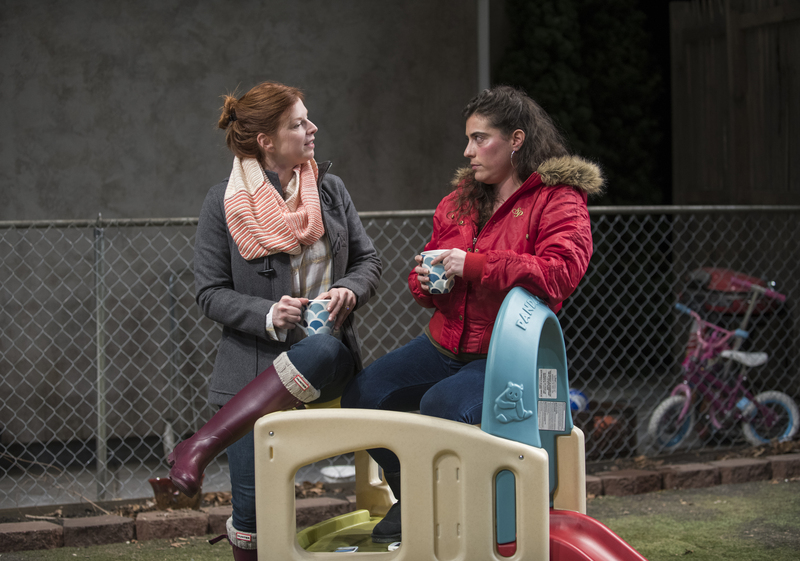 Directed with a deft touch by Jessica Fisch (mother of a one-year-old), Cry It Out focuses on new mother Jessie (Darcy Nalepa), a lawyer who lives in a New Jersey duplex with her young family. Feeling stuck and alone in the weeks following her daughter’s birth, the quiet Jessie befriends her blunt-speaking, boisterous neighbor Lina (Laura Lapidus) over a backyard coffee. Lina, also a new mother, needs companionship as much as Jessie does, and their Odd Couple friendship grows rapidly. Metzler also introduces another pair of neighbors, the wealthy couple whose house is high on a hill overlooking Jessie’s back yard. Mitchell (Gabriel Ruiz) has been watching the two women from on high (with a telescope, which is not creepy at all) and desires for them to befriend his wife Adrienne (Kristina Valada-Viars) whom he believes to be suffering from a form of post-partum depression so deep that she won’t even touch her child. 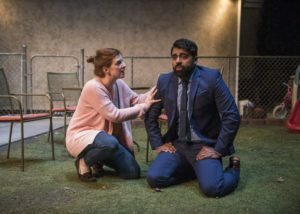 The play shows the enormous emotional changes that parenthood brings with it as life becomes inevitably, inviolably about the baby. Metzler’s dialogue is spot-on. (She too has small children in the house, so she knows how to speak “Mom.”) Amid conversations about sleep-training (the “Cry It Out” method involves letting the infant cry until they fall asleep, while other methods advocate being Mommy-on-the-spot when baby starts to mewl), shopping with child, day care, and other issues, Jessie and Lina’s bond grows from a highly awkward first meeting to something akin to sisterhood. That first session is a joy: with no furniture in the yard to focus the action, Fisch creates perhaps the most intentionally stiff and graceless blocking you’ll ever see, the actors circling each other and the yard as if they have no clue what to do with themselves. And that’s the point: these women are feeling each other out, checking to see if a friendship might germinate, and there is little more awkward than spending quality time with someone you don’t really know. At one point, as if to highlight the floundering conversation, Lina is even blocked with her back to the audience for a prolonged period. Our discomfort mimics theirs. Nothing, however, is more uncomfortable and klutzy than the introduction of Mitchell, who just decides to interpolate himself into these women’s lives one day. Imagine walking into some stranger’s back yard with an odd, personal agenda, and you have some notion of the utter awkwardness of Mitchell in this moment. That Jessie feels something for the man and agrees to meet his wife (despite Lina’s strong objections) says something about her genuine kindness. Both of these friends are kind, of course, but Lina doesn’t suffer fools gladly. In fact, her first meeting with the aloof, angry Adrienne allows Lapidus the opportunity for some hilarious physical comedy mocking the woman as Adrienne stubbornly peruses her iPad. Yet even after meeting this obnoxious person, Jessie’s compassion outweighs her distaste and she invites Adrienne to return. Cry It Out centers on issues connected to new motherhood and careers. Jessie has decided that she does not want to return to her law firm (where she’s about to make partner); she’d rather stay with her baby. Lina would love nothing more than to do the same, but there is no way that her blue collar family can afford it. And Adrienne? Her high-visibility career as a jewelry designer takes precedence over everything. 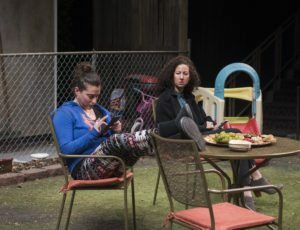 The play touches on gender roles, the high cost (both financially and emotionally) of child care, dealing with less than adequate caregivers, and the reality that, in America, it is only the well off who can afford to stay at home with their children. But its real focus is the honest, powerful relationships that women form with each other. The men in these women’s lives are so peripheral than we never meet them; it is the connection that Jessie and Lina forge that is something special. Metzler’s play openly declares the truth in Ali Wong’s line about needing a crew to survive. If they cannot rely on their men—and they can’t, for (as the play makes clear) the men just don’t get it—these women need each other. And as we move deeper into an administration whose only concern for women is in restricting their ability to get an abortion, it is clearer than ever that the only hope for any of this comes from women themselves. Many, many of us are Jessies and Linas, meeting over children and becoming friends because of them (and despite them: the show pulls no punches about the need to attend to baby’s needs right now), and this is one of the most realistic shows I have ever seen on the subject. The characters and dialogue could have been pulled from any new mothers group. And the bottom line is that new parents discover for themselves that their children don’t come with manuals; everything is ultimately up to the parents to teach and decide. 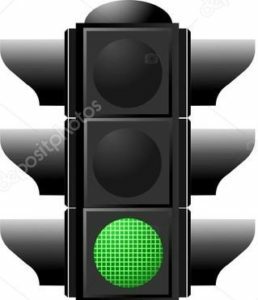 There is no “right” and “wrong” way; there is only “our” way. And it’s completely impossible to know for sure that you are doing the best thing for your baby. But it’s sure nice to have a friend to have your back. Cry It Out is now playing at Northlight Theatre, 9501 Skokie Blvd, Skokie, until June 17. 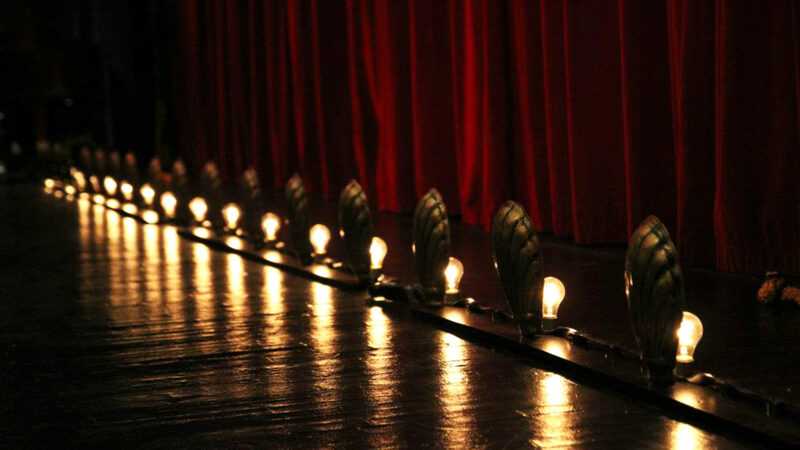 Performance times vary; check the website at Northlight Theatre. Find more information about current plays on our Current Shows page and at theatreinchicago.com.